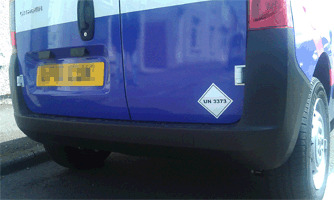 UN Labels are used to alert people to hazardous materials and substances during transportation. These labels help people, such as the emergency services, identify hazardous materials and substances whether they be in solid, liquid or gaseous forms, through their own specific number code. Our extensive range of UN Labels includes butane, Ethyl acetate, kerosene, perfume products and much more. Our UN labels range is compliant with BS 5609, and meets the requirements for transport by rail (RID), by air (IATA), by road (ADR) or by sea (IMDG). These UN identification details have universal application and are four digit numbers assigned to hazardous substances by the United Nations Committee of Experts on the Transport of Dangerous Goods. To purchase, click on the label that meets your requirement from our range below, add to your basket and follow the on screen instructions. UN 1789 (Hydrochloric acid) label. UN label with write on panel. UN 1101 (Butane or butane mixtures) label. UN 1133 (Plastic primer and cleaner) label. UN 1169 (Adhesive containing flammable liquid) label. UN 1170 (Isopropyl alcohol, flammable liquid) label. UN 1173 (Ethyl acetate) label. UN 1193 (Ethyl methyl ketone) label. UN 1198 (Formaldehyde solutions) label. UN 1210 (Printing inks) label. UN 1219 (Combustible liquid, ethanol, methanol, meths spirit) label. UN 1223 (Kerosene, coal oil) label. UN 1247 (Methyl methacrylate monomer) label. UN 1263 (Paint including thinnners, drying compound, varnish, polish) label. UN 1265 (Perfume products with flammable substance) label. UN 1266 (Perfumery products with flammable solvents) label. UN 1268 (Petroleum distillates - petroleum ethers) label. UN 1300 (Tars asphalt, road tar marking products ) label. UN 1307 (Xylene ) label. UN 1325 (Flammable solid organic e.g. ethanol ) label. UN 1479 (Bleaching products ) label. UN 1591 (Dichlorobenzene ) label. UN 1593 (Dichloromethane ) label. UN 1648 (Acetronitrile ) label. UN 1719 (Caustic alkali liquid ) label. UN 1760 (Caustic soda ) label. UN 1768 (Difluorophosphoric acid, anhydrous) label. UN 1790 (Hydrofluoric acid) label. UN 1791 (Sodium hypochlorite, bleach, chlorine) label. UN 1805 (Phosphoric acid, acetone) label. UN 1824 (Sodium hydroxide) label. UN 1830 (Red phosphorus, acetone) label. UN 1866 (Resin solution, flammable) label. UN 1933 (Flammable liquid, Xylene) Label. UN 1986 (Alcohols, general) label. UN 1987 (Alcohols, etanol, methanol, isopropanol) label. UN 1992 (Flammable acetonitrile, methanol) label. UN 1993 (Flammable liquids containing petroleum distillates ie xylene) label. UN 2319 (Turpene hydrocarbons) label. UN 2428 (Sodium chlorate, aqueous solution) label. UN 2468 (Trichloroisacyanuric acid, dry) label. UN 2734 (Amines or polyamines) label. UN 2735 (Corrosives, fatty acids) label. UN 2810 (Pesticides, weed killer) label. UN 2811 (Ammonium oxalate, caffeine) label. UN 2880 (Calcium hypochlorite) label. UN 3077 (Environmental hazard, solid) label. UN 3082 (Lead chromate, lead thiocyante, strontum oxalate, magnesium oxalate) label. UN 3085 (Oxidizing solid) label. UN 3089 (Metal powder, flammable) label. UN 3175 (Solids containing flammable liquids) label. UN 3260 (Corrosive solid, acidic, inorganic) label. UN 3264 (Corrosive liquid, acidic, inorganic) label. UN 3265 (Fungicide, corrosive liquid) label. UN 3266 (Corrosive liquid, basic, inorganic) label. UN 3267 (Corrosive liquid, basic, organic) label. UN 3269 (Polyester resin) label. UN 3469 (Paint related material, flammable, corrosive class 3) label. UN 3470 (Paint related material, flammable, corrosive class 8) label.